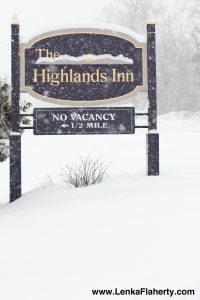 The Highlands Inn is located on a half-mile country road just off Route 302 in Bethlehem, NH, two miles east of Interstate 93, Exit 40 in New Hampshire. From Boston: Take I-93 north to Exit 40 in New Hampshire, then Rt. 302 east for 2 miles. Approximately 2-1/2 hours. From Montreal: Take Rt. 10 east to Rt. 55 (Magog), then I-91 to St. Johnsbury, then I-93 to Exit 40. Then Rt. 302 east to the Inn. Approximately 3 hours. From New York City, Northern NJ, and Southern CT: Take I-95 north to New Haven, then I-91 north. If you want to stay on Interstates, get off I-91 north at Exit 19 in Vermont onto I-93 south, then take I-93 south to Exit 40 in New Hampshire, then Rt. 302 east for 2 miles. If you prefer seeing some small towns, get off I-91 north at Wells River-Exit 17 in Vermont, then take Rt. 302 east to Bethlehem (about 30 miles). Be sure you stay on Rt. 302 east. When you go through Wells River, VT, Rt. 302 takes a sharp left towards Woodsville, NH. Approximately 6 hours from NYC by either route. The Closest Major Airport: Manchester, New Hampshire is served by most major carriers and is one-and-one-half hours south of The Highlands Inn off of I-293. When you exit the airport, take Brown Avenue north for 1.5 miles, then follow signs to I-293N via the ramp on the left off Brown Avenue. Take I-293N for 9 miles. I-293N merges onto I-93N. Take I-93N for 95 miles to Exit 40 in New Hampshire. Take Exit 40 onto Rt. 302 east for 2 miles. The Highlands Inn sign is on your left.